Definition at line 31 of file VideoDemo.cpp. Definition at line 45 of file VideoDemo.cpp. 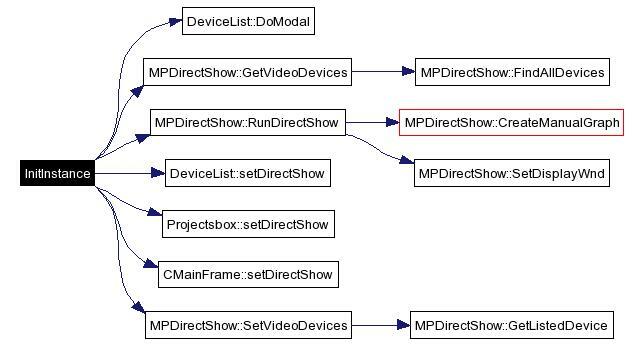 References BOOL, dl_capture, DeviceList::DoModal(), MPDirectShow::GetVideoDevices(), m_directShow, MPDirectShow::RunDirectShow(), DeviceList::setDirectShow(), Projectsbox::setDirectShow(), CMainFrame::setDirectShow(), and MPDirectShow::SetVideoDevices(). 00052         //  the specific initialization routines you do not need. 00060         // Change the registry key under which our settings are stored. 00062         // such as the name of your company or organization. 00067         // object and then sets it as the application's main window object. 00097         // The one and only window has been initialized, so show and update it. Definition at line 158 of file VideoDemo.cpp. Definition at line 169 of file VideoDemo.cpp. Definition at line 177 of file VideoDemo.cpp. Definition at line 27 of file VideoDemo.h. Referenced by InitInstance(), OnAppProject(), and OnFileSavevideo().